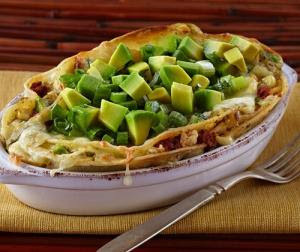 A twist on a classic casserole, which includes cubed chicken, cooked chorizo, tortillas, cheese and cubed avocado. In a medium skillet, heat four tablespoons oil over medium-high heat. Gently add a tortilla and cook until softened, about 10 seconds each side. Transfer onto a plate lined with paper towels. Once you've cooked the first six tortillas, add the rest of the oil, allow to heat and continue to cook the remaining tortillas. In a bowl, combine chicken, chorizo, corn and avocado. Toss lightly until combined. Soften sour cream in its own container by whisking with a fork. Pour 1 cup salsa verde onto a 9" x 9" baking dish, spreading into an even layer. Place 4 tortillas on the salsa allowing them to overlap each other. Spread ½ chicken-chorizo mixture onto tortillas. Add one cup salsa verde. Next, dollop sour cream on top in even amounts and sprinkle with ½ cup cheese. Repeat process to create another layer. Top with remaining tortillas, salsa, sour cream and cheese. Cover casserole with foil and bake in preheated oven for 35 minutes. Remove foil and bake for another 10 minutes until edges are brown and crispy and cheese is bubbly. Sprinkle cilantro and green onions over casserole and serve. Garnish each serving with an avocado slice.